Isolation, uncomfortable stares, hurtful comments and a lifelong adjustment are just some of the struggles of a mother of a determined one. But on Sunday, a set of 15 mothers of determined kids came together to display their talents and show the world how they create happiness. 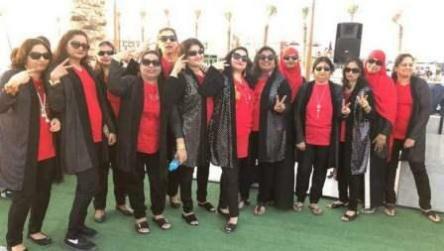 Called Super Special Moms, the group took over the stage at Emaar's Rise Dubai Creek Harbour to give out a strong message to the community through a string of performances that "We are the warriors of our determined ones. We are special not weak." The Emaar event, #Building Communities, saw determined ones and their mothers display their talent with a number of performances that included artwork, karaoke, drama and dances. After a couple of performances of the determined ones, the audience was surprised to see 13 mothers of the determined ones, dressed in red and black attire, take over the stage. The mother's then performed a 'lazy' dance or a standing dance, where they stood on the stage wearing sun glasses and danced with only actions and not moving much. They then sang some karaoke songs and finally performed dances on some foot tapping Bollywood numbers that left the crowd of over 300 people asking for more. "Our intention of to show the world that we are happy despite having kids of determination. We are strong women and this does not stop our life in any way. We want to call upon other special mothers to be happy like us. Happiness is an integral part of our being because we know that if we are happy then only can our children and family be happy. We want to tell the world that even though we have children of determination, our life is not sad, we have learnt to be happy," Meena Noronha, founder of the Super Special Moms group, who was also hosting the show and performing dances, told Khaleej Times. "We want to tell the world that a mother of the determined has her own weapons to defend her family from any negativity. Our weapons are inner strength, love, patience, smile and happiness. We want to showcase that we are the warriors of our determined ones. Since they cannot speak for themselves, we will speak for them," she added. Another super mom Keerthana, who was part of the singing team of moms, said: " I believe all these special moms are very talented but in our struggles of our daily life we forget our self. Many of us got a chance to be on stage after a gap of about 30 years. I think I last went up on stage when I was a kid. Imbued with confidence, Keerthana said: "We had forgotten to have fun as we got so busy bringing up our kids. Our life totally revolved around our determined ones and their needs. But after this performance on stage all of us we feel so happy, confident and encouraged. There is no looking back. We are ready for more!" From the audience Roshan Shetty, father of Aisiri Shetty, a child of determination, who performed a ramp walk and karaoke at the event said: "This was a fantastic show by these super moms and more importantly the message which was conveyed was so touching. We have always seen children of determination being encouraged by being given a chance to display their talent and parents are always seen as struggling and sad. But these super moms have completely changed the picture and have shown how strong and important these special mothers are and how they have outgrown any kind of challenges that come in their way. It was strength that was on show tomorrow and that was so inspiring. Kudos to all of them!"